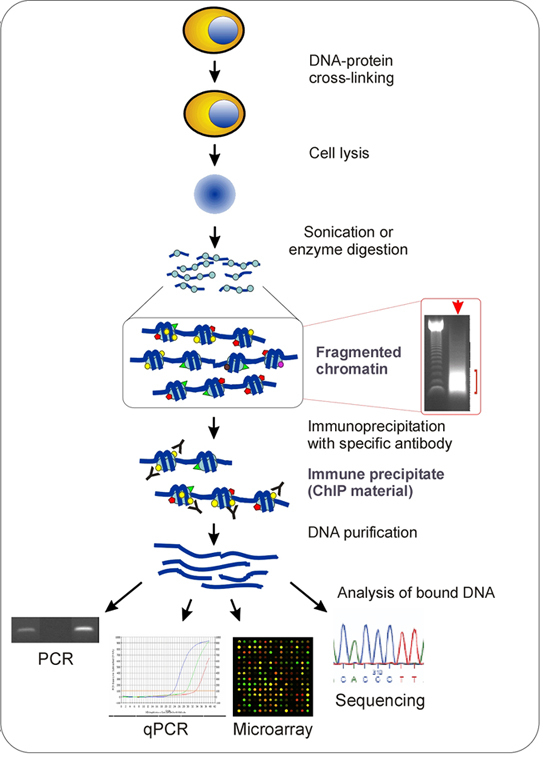 One of the most powerful tools at our disposal to study proteins that bind DNA is chromatin immunoprecipitation (ChIP). This technique is performed with the end goal of identifying a segment of DNA that a protein binds. As with any technique involving many steps and different antibodies, ChIP experiments can have many different optimizations. Generally, however, it follows a fairly simple protocol. First, you must subject the cells to whatever experimental condition you desire. Perhaps you are adding a drug to see how it affects binding of transcription factors. Perhaps you are trying to simply see under normal conditions what part of the DNA is bound by protein. You must isolate the chromatin after cell lysis taking care to avoid destruction of the DNA. Second, you will perform a cross-linking step to make the protein to DNA interactions permanent. It works similarly to fixation in immunohistochemistry where formaldehyde causes the formation of covalent bonds where there used to be electrostatic or hydrophobic interactions. Next, the chromatin attached to the protein must be purified away from the rest of the DNA. For this, researchers usually employ sonication or some other method to shear the genomic mass of DNA. Proteins in general will provide some shielding against this effect and leave the DNA of interest intact. Fourth, you purify the protein out of the mixture using immunoprecipitation. This involves binding a specific antibody to the protein and pulling it out of solution. To precipitate the protein, you use beads that are bound to non-specific antibody interacting molecules like protein G or protein A. This purifies both the protein and the DNA to which it is bound. Finally, you will amplify the bound sequences using polymerase chain reaction. This will allow you to generate enough purified DNA to either estimate the amount of binding or identify the fragment of DNA to which the protein originally bound. Once you have the DNA sequence, you can use computational software to understand more about what part of the gene your protein of interest appears to regulate. Overall, ChIP is one of the most commonly-employed methods to assess protein binding to DNA. With it you are able to characterize the DNA binding response in the presence of a treatment or expression of different proteins. The specific parameters of a ChIP experiment may vary, but you will find that the steps outlined here are going to be used in most protocols. 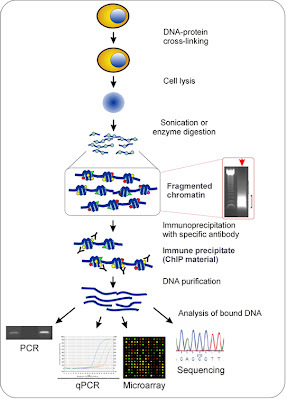 The chromatin immunoprecipitation (ChIP) assay.